In an effort to combat the rise of unsanctioned student parties that take place in university communities across the province, homecoming football games will take place on one of two weekends this fall. Homecoming football games in Ontario will occur on just two weekends this fall in a bid to curb unsanctioned student parties, one university official says. Some cities have seen student parties grow in recent years. In many cases, students will travel to other cities for a homecoming party. In September 2018, then-Guelph police chief Jeff DeRuyter called on Ontario University Athletics (OUA) and the university to do something to prevent the "homecoming circuit." That came after the service responded to 586 calls for service in a 24-hour period during homecoming weekend. 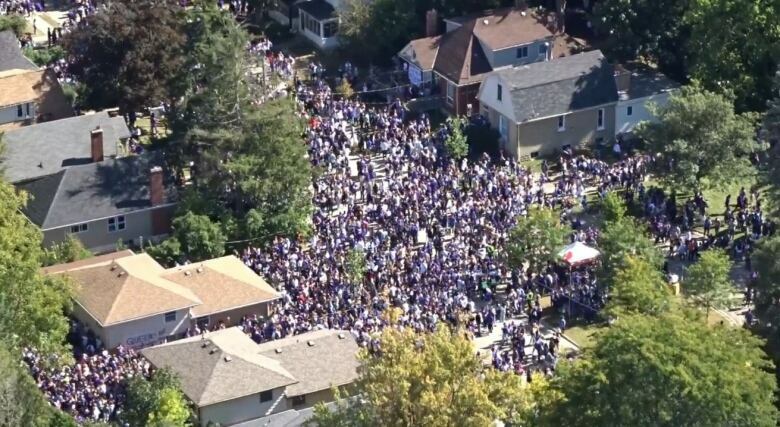 Wilfrid Laurier University in Waterloo also saw an unsanctioned student party grow to 14,000 students in September 2018, double the crowd that took over Ezra Avenue in 2017. Now, the OUA and the universities have listened. 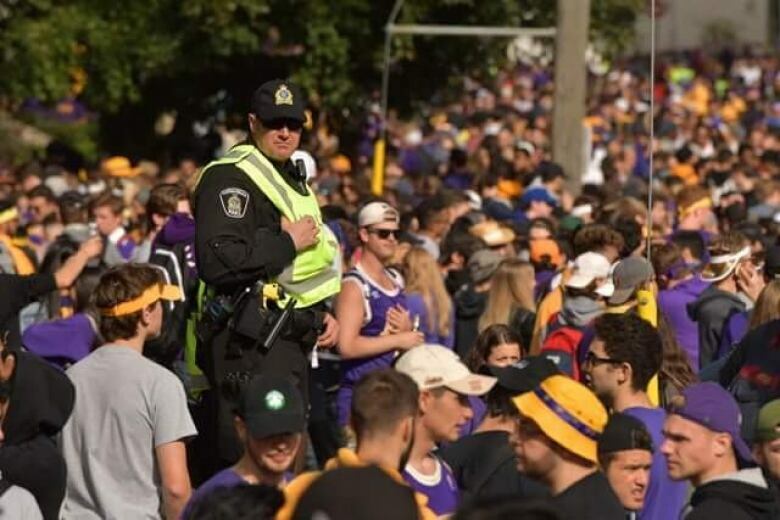 Kevin Crowley, director of communications for Laurier, said homecoming football games across the province will take place on one of two weekends, rather than spread over five or six weeks. Gord Grace, the CEO of the OUA, told CBC Kitchener-Waterloo they were approached by the Council of Ontario Universities to look for ways to address the parties that often happen along with homecoming games. Grace said they looked at the schedules and determined two dates for home football games. "The idea was that by consolidating them, at least you wouldn't have students travelling to the different homecoming events. There was no way we could put them all on one day," he said. He said they'll try this out for the 2019 season, and then reassess afterwards to see whether it's something that helped. It was no easy matter though, Grace noted. The schedule is built based on final standings of the previous season. "We were happy to help do it. Scheduling is like a Rubik's cube, though. Just when you have one side figured out, then the other side's out of whack," he said. "If it's a positive impact, if it's made a difference, then we'd probably look to do it again for the fall of 2020." Crowley notes students travelling for parties is a big problem for all unsanctioned events, not just homecoming. "It's a phenomenon that's happening in municipalities in university communities right across Ontario and in the States as well," he said. It's particularly an issue for the St. Patrick's Day student party that takes over Ezra Avenue every March. In 2018, police estimated 22,000 people took to the small street just off Laurier's campus. In previous years, bus trips from other schools have been organized to bring more students to the party. Crowley said while they can remind Laurier students they could face repercussions if their behaviour doesn't meet the school's code of conduct, the school can't do anything about students from other cities. He said this year's St. Patrick's Day celebrations will look very similar to last year's, although they are preparing in case there's a longer party. With St. Patrick's Day on a Sunday, Crowley says it's possible some students will start celebrating Friday night. "We're emphasizing respect for the neighbours and for each other and for the law enforcement folks that are out," he said, noting the door knocking campaign held each year will take place on March 13 to talk to people in the neighbourhood about the event. Trying to shut down the party at this point isn't a viable option, Crowley said. "If it was simple, the partners would have brought this to an end a long time ago but it's far more complex and simple than some people might appreciate," he said. "It's going to be a long game." In speaking with colleagues at other schools, Laurier's vice president of student affairs David McMurray realized just how big the issue is and invited officials to meet to discuss what they're doing. On Friday, officials from eight other universities met at Laurier to discuss unsanctioned student gatherings: University of Waterloo, University of Guelph, University of Ottawa, Carleton University, McMaster University, Western University, Queen's University and Brock University. "It was a day of discussion to see what are the common challenges, what are the things we're all facing, and then what's working and what's not," Crowley said. "There wasn't any sort of formal resolution or action items at the end of the day other than a commitment to continue talking and sharing best practices."